Its tall curved three wing 'Y' shape inspired the Chicago-born architect Adrian Smith in the conception of the Burj Khalifa. The architects for Lake Point Tower were John Heinrich and George Schipporeit, working under the firm name of Schipporeit and Heinrich; the two were students of Ludwig Mies van der Rohe, one of the best known architects of the Bauhaus movement and International Style school, who taught at the Illinois Institute of Technology in Chicago. Lake Point Tower was completed in 1968, is approximately 645 feet (197 m) tall, and was the tallest apartment building in the world at that time. The project developer was William F. Hartnett, Jr., chairman and founder of Hartnett-Shaw Development Company, which was responsible for more than 260 residential and commercial real estate developments in the United States from 1961–1983. Because of its height and lakeside site, the skyscraper had to be designed to withstand high winds. At the center of the building is a triangular core, 59 feet wide, that contains nine elevators and three stairwells. This core holds all of the vertical weight of the building, allowing the perimeter columns on the facade to be much smaller. 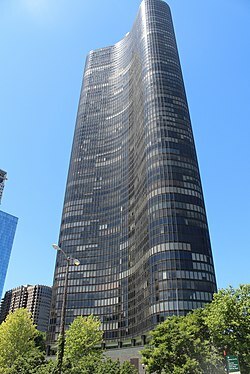 Well known for its graceful curves and enviable location, Lake Point Tower is the only major private structure on the lakefront side of Lake Shore Drive and likely to remain that way for the foreseeable future, given the city's prohibition on building on the lakefront. At the top of the building, on its 70th floor, is the Cité restaurant. Lake Point Tower was one of the first high-rise residential buildings in the world to feature all-electric appliances and utilities and pioneered the concept of the "Park in the City," being the first residential complex in a major city to have its own two-and-one-half acre park—including a playground, pool, duck pond, and waterfalls—three stories above ground. The building also features an assortment of shops and restaurants on the second and ground levels of the complex, under the third-floor park. Lake Point Tower's position between Lake Shore Drive and Navy Pier gives it unimpeded north, east, and south views that are protected, for the foreseeable future, by the ordinances controlling use of the city's lakefront. A wedge of the cityscape view to the southwest would have been lost to architect Santiago Calatrava's Chicago Spire, which was to be built diagonally across from Lake Point Tower on the other side of Lake Shore Drive. However, the spire project was a casualty of the nation's economic recession—construction was halted in October, 2008. Though unintended, users on sites such as Reddit have credited the building as appearing like a fidget spinner. Lake Point Tower also likely inspired the fictional Merlaut Hotel featured in the video game Watch Dogs. Helen Reddy, singer of "I am Woman; Hear Me Roar"
^ Kamin, Blair. "50 years later, Lake Point Tower is a singular achievement — and let's hope it stays that way". chicagotribune.com. Retrieved 2018-09-23. ^ Heise, Kenan (January 22, 1993). "John Heinrich, Architect for Lake Point Tower". Chicago Tribune. Retrieved 6 June 2018. ^ Lepik, Andres (2005). Skyscrapers. Munich: Prestel. pp. 84–87. ^ Blaser, Werner (1981). Mies van der Rohe: Continuing the Chicago School of Architecture. Basel: Birkhauser Verlag. pp. 224–27. 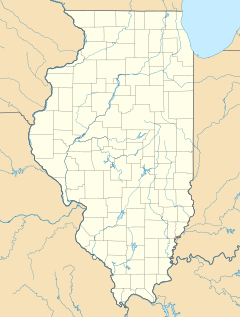 ^ "Cité Chicago". www.citechicago.com. Cité Chicago. n.d. Retrieved August 20, 2017. ^ "This building looks like a fidget spinner". Reddit. Retrieved 23 May 2018. ^ "Found the fidget spinner headquarters". Reddit. Schulze, Franz; Kevin Harrington (2003). Chicago's Famous Buildings. Chicago, IL: University of Chicago Press. p. 157. Sinkevitch, Alice (1993). 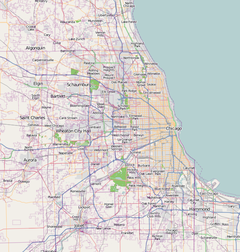 AIA Guide to Chicago. Orlando, FL: Harcourt Brace & Company. pp. 117–18. Windhorst, Edward; Kevin Harrington (2009). Lake Point Tower: A Design History. Chicago Architecture Foundation. ASIN B003MTAHV8. 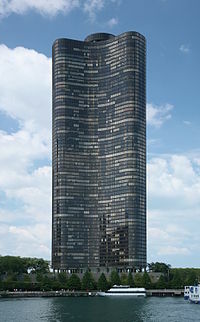 In 2007, the American Institute of Architects  listed Lake Point Tower as one of America's 150 favorite structures.